Vertical Gardens: how high can they go? Worth Avenue defines high end shopping in Palm Beach, Florida. High end appears in a different guise at a junction beside the avenue, where a vertical garden clothes a bare wall. 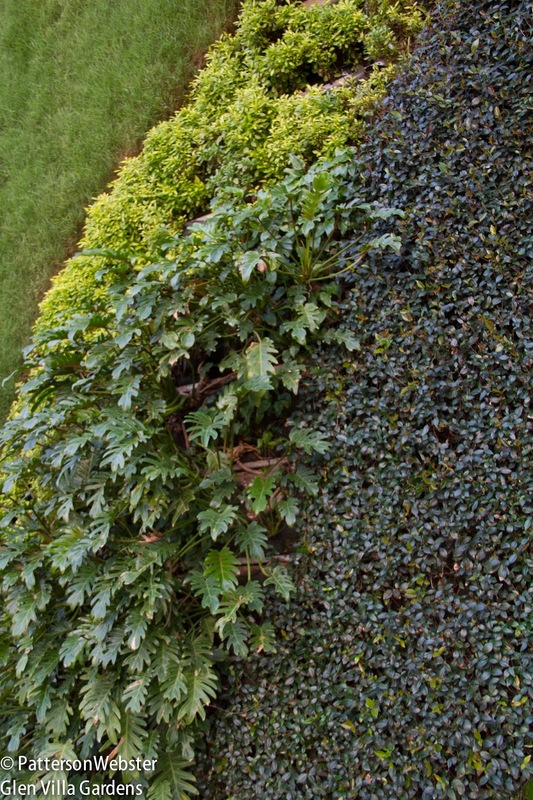 Eleven different types of plants make up this wall. Late day shadows make the wall look less interesting than it is, but a close-up shows some of the variety of textures and shades of green that create the 840 square foot wall. 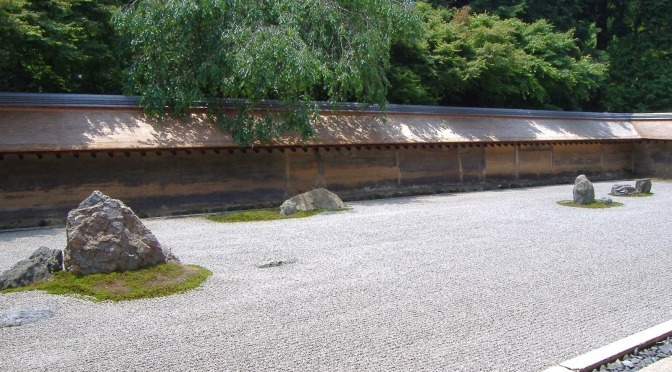 In total, almost 11,000 plants create a stunning curvilinear design. Four textures and four shades of green. Doing some research about this vertical garden, I was surprised (and pleased) to learn that it was done by GSky, a Canadian firm based in Vancouver. 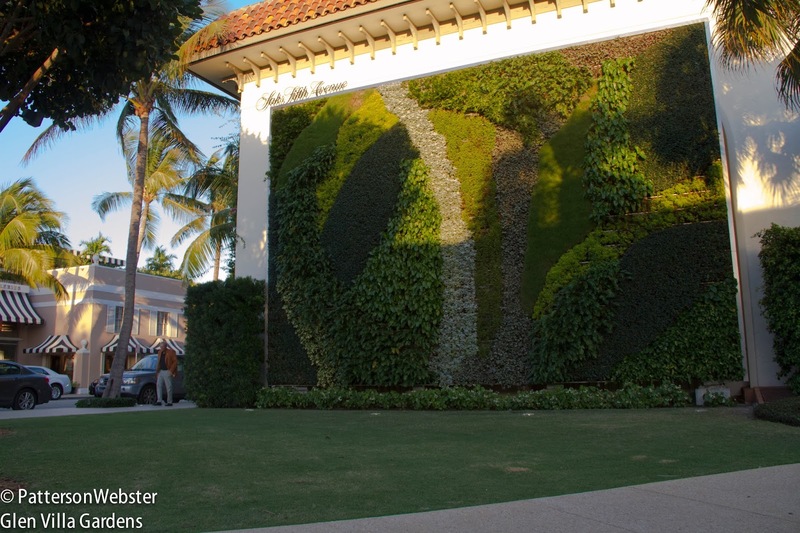 The wall was designed by Deborah Kotalic of GSky in collaboration with the Garden Club of Palm Beach. It was installed over four days in 2010. 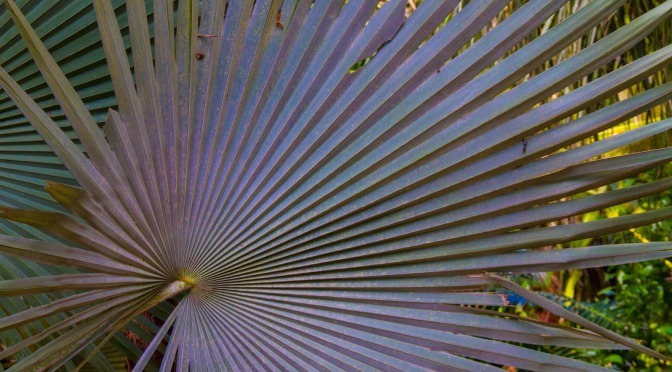 Plants used are Mondo Grass, Xanadu Philodendron, Asiatic Jasmine, Silver Sawtooth Palmetto, Alternanthera ‘Yellow,’ Muehlenbeckia Axillaris, Philodendron ‘Burle Marx,’ Zebrina pendula, Coonie and Zoysia grass. (Names were listed on the GSky website.) GSky’s sophisticated computer systems monitor the installation daily to ensure that all remains in good working condition. Robert Richardson, a regular blog reader and commenter based in British Columbia, recently passed on a link to a higher — and different kind of — vertical garden. Clearpoint Residencies in Sri Lanka is now under construction. When finished in 2016, it will have 46 stories and stand 186 metres, or 610 feet, tall. All terraces will be densely planted to create a green façade. Densely planted high-rises seem to be a trend around the world. But in the small village of North Hatley, Quebec, we do high rise gardening of a different sort — and on a much smaller scale. 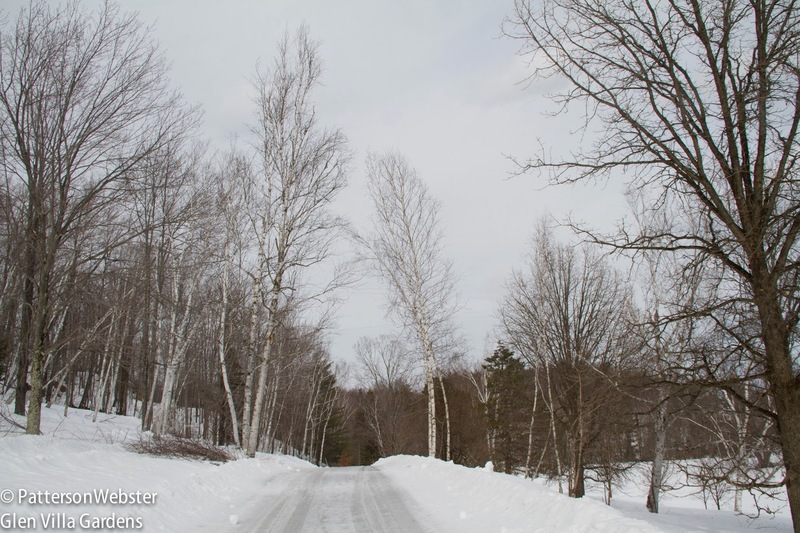 This view of our driveway shows a group of birch trees that were badly damaged in January’s ice storm. You may notice that the top of one of them, on the right side of the drive, is bending rather awkwardly to the left. the branches of the birch trees almost blend into the sky. Can you spot anything else? 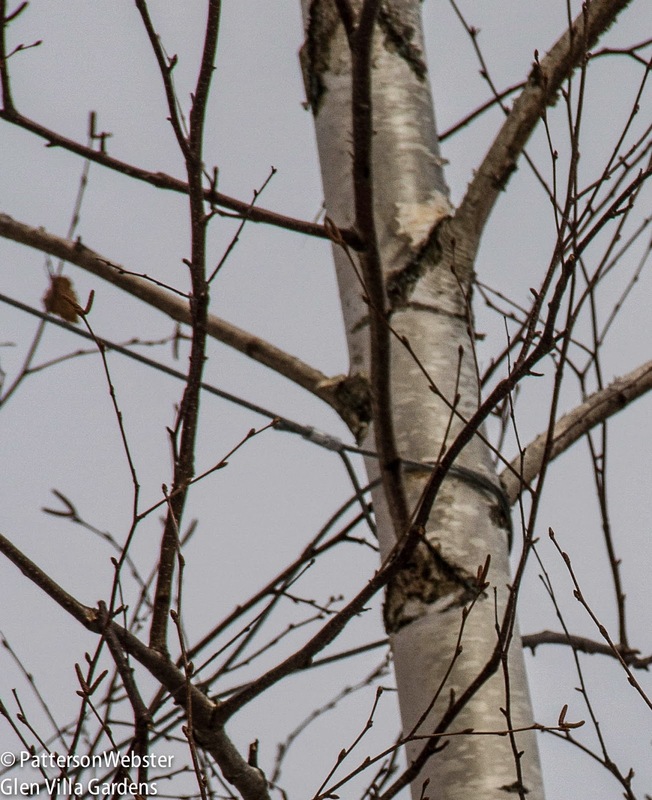 A week ago the branches were leaning to the right in an arc that reached almost to the ground, a typical formation for birch trees that suffer damage from snow and ice. According to observation, birches don’t recover from this kind of damage — I’ve encountered many examples during the walks in the woods, all bent in the same distinctive arc. In the woods, these arcs aren’t a problem. But along a nice straight driveway, a u-shaped tree is not a plus. Tall, straight trees are what is called for. Since I knew they wouldn’t recover on their own, removing the birches seemed the only choice. But the trees have been there for the last dozen years or so, and I hated to cut them down. So we are trying something different — aerial gardening with cables. Can you spot the cables in the photograph above? I can’t, even knowing where they are. Driving underneath, the wires become visible. But only barely. 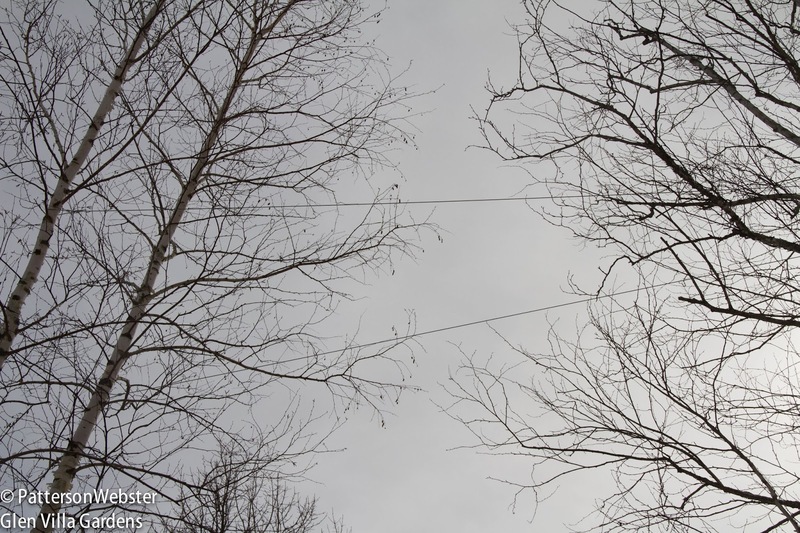 Thin cables are holding the tops of the birches up straight. Will they stay that way when the cables are removed? The cables are tied mid-way up the arc, and are attached to the trunk of undamaged trees on the up-hill side of the driveway. Will this work? I have no idea but it seems worth trying. the cable is padded where it touches the trunk. I don’t know how long we will keep the cables in place, or if the trees will bend again when the cables are removed. It’s an experiment. I feel I owe it to the trees: they’ve grown well for us, so I’m returning the favour. Do flowers make a garden? Lady Byng, Where Are You? The hunt is on for a lost peony, the Lady Byng. This special peony was said to be very pretty, and it definitely was colourful, bright crimson carmine with a distinctive cushion of buff and deep red. It was also expensive: in 1926, it cost an astronomical $35. 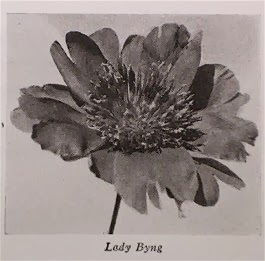 This is what it looked like: The only known photograph of the 'Lady Byng' peony The peony was developed by Harry Norton, a Canadian peony breeder from Ayer’s Cliff, Québec, who bred many peonies in the early years of the 1900s.